Mommy Brain?? | My Cup Runneth Over ... and So Does My To Do List! Yes, that has to be it…definitely Mommy Brain! Why else would I forget to restock one of the most important basic necessities in a home of 7 people? A product in which 6 of those 7 people use everyday, and 3 of those 6 people use MANY times a day! It is a product that I would hope to never run out of…um…but somehow I did?! I am speaking of toilet paper. Yes, I do realize some families, and some countries can make it just fine without toilet paper…. *shudder at the thought*. However my friend, my family is not one of those, nor, do we wish to be! 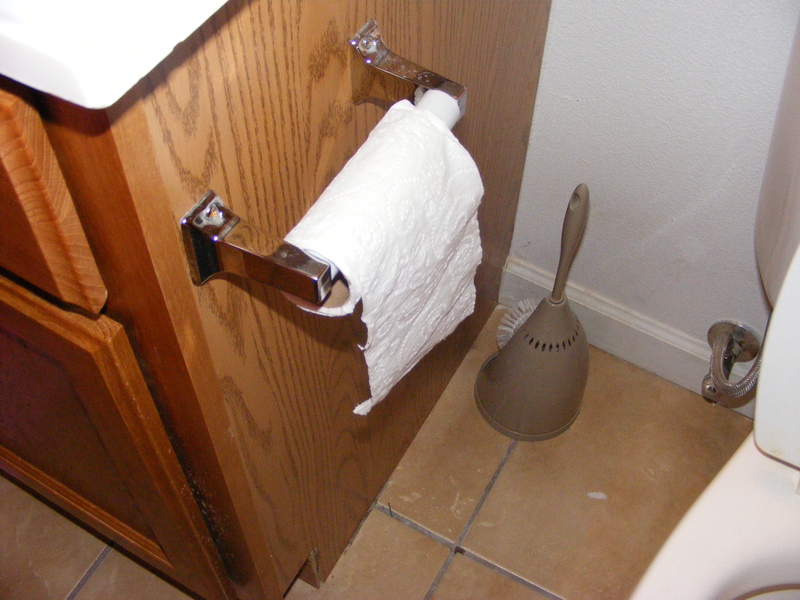 I could easily lay the fault over on the children, because they are given the job of replacing empty toilet paper rolls in each bathroom with new rolls. Unfortunately, I can’t do that either. Reason being, the 7 year old told me…AND showed me a few days ago that there was only one roll left in the pack. And you would think that his panic over the fact would be enough to keep me from forgetting. His exact words, “OH NO, Mama we have a problem!”. Me, “It’ll be ok, I will buy some more before we run out completely”. *Blushing* But in my defense, the toilet paper wasn’t completely gone. See we had some left! Now that you know that I forgot, want to know what made me remember? *A little background history* In our home, when someone has just used the restroom and they so strategically reach over to pull some toilet paper off the roll to finish the job, and uh oh, the roll is empty, you will here said person shouting loudly from behind the closed bathroom door “I need more toilet paper!” What happens next is, whomever is closest to the closet where the extra toilet paper is stored, grabs a new roll and quickly takes it to said stranded person. So last night as our family was gathered around the dining table eating dinner, there was a knock at the door. It was my FIL and BIL. After letting them in, I thought that I would tidy up the guest bathroom (the kids’ bathroom) while they chatted with DH in the livingroom. Upon entering the bathroom I immediately notice that there is no toilet paper. My first thought was “Uh Oh”, and it was then that I remembered the 7 year old’s panic, and my promise to buy more before we ran out! Thankfully though the master bathroom had 1/4 of a roll left, so I quickly place it in the other bathroom, and pray that the children do not need to use it , or if they do, that our guests do not! Because, the thought of my FIL or BIL yelling from behind the closed bathroom door “I need more toilet paper“, is disturbing enough without the thought of having to yell back, “I’m sorry, but we are out, would you like some baby wipes?!?”. Not to worry though, the children and I took a road trip over to WM today and we now have 24 brand new rolls of our beloved toilet paper! ← A New year, A New start! The funniest part is thinking of your FIL or BIL calling out for TP!